Few people, perhaps, understand the seasonal alchemy of Mother Nature better than Jane Palmer, co-creator of the Noon Solar line of bags and now the founder of the first—and so far only—natural-dye production house in the United States. Launched in January and based out of Chicago, Noon Design Studio is committed to using sustainably harvested natural materials as a low-impact alternative to toxic fabric treatments. More significant, however, is that it endeavors to do so at a cost-efficient, production scale. The ancient Egyptians used red cotton dyed with madder root to mummify their Pharaohs. Because of industrialization, most textiles today contain toxic substances such as lead, other heavy metals, and arsenic. 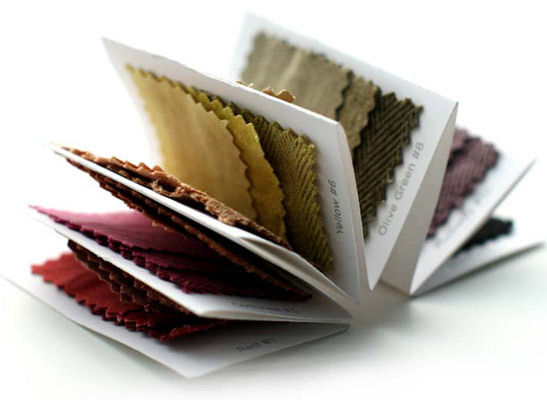 Although naturally dyed fabrics are completely biodegradable and nontoxic, they’ve been consigned mostly to one-off, artisanal designs. 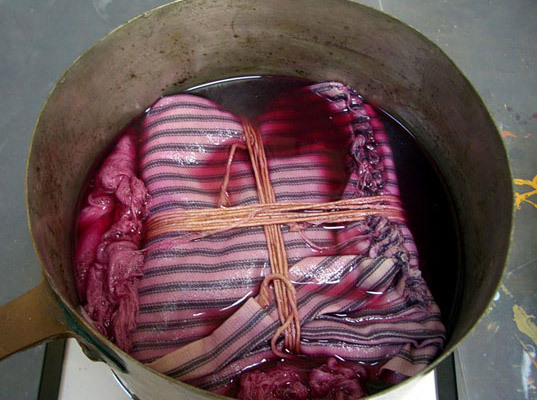 A vat of scarlet dye extracted from cochineal insects. It was during her time at Noon Solar that Palmer and her business partner, Marianne Fairbanks, determined a way to take natural textile dyeing on a broader production level. Thanks in large part to an industrial dye machine (basically a high-quality industrial washing machine that Palmer programmed to use with natural dyes), Noon Design Studio is able to dye fabrics in higher volumes. 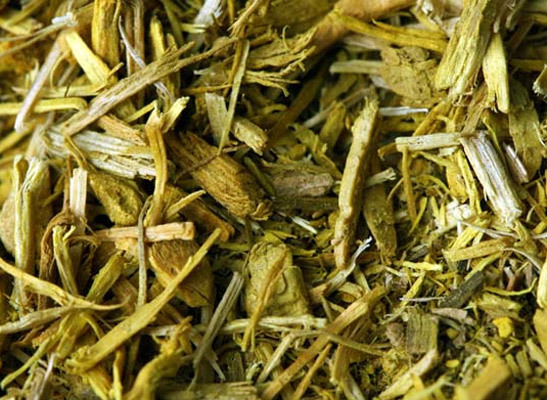 The water and energy used in natural dyeing is minimal, and the water runoff can be returned to the water table. Whether created from madder root, pomegranate, walnuts, indigo, or cochineal insects, natural dyes can yield some of the most brilliant hues imaginable. Plus, the water and energy used in the process is minimal, and the water runoff can be returned to the water table without any ill effects. 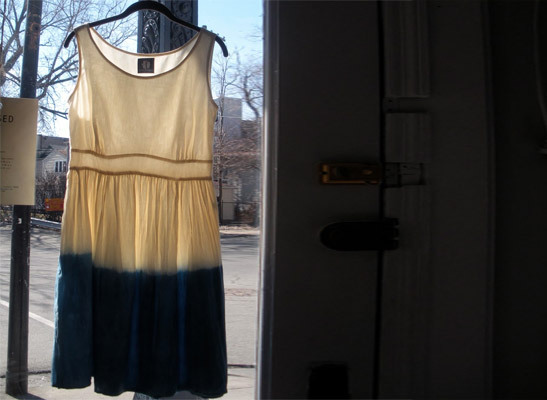 Noon Design Studio’s first client was Annie Novotny of Frei Designs, whom Palmer helped dip-dye her organic cotton pieces in indigo. Despite their reputation for washing out, natural dyes can be just as colorfast as chemical ones. Brilliant, love the machine. Wish I had one, all my dyeing's done on my stove top! Did you get my comments? 1) very nice presentation 2) I have been a professional natural dyeworks in US for 41 years, since 1969. see at www.aurorasilk.com 3) would you like to do an interview? Few people, perhaps, understand the seasonal alchemy of Mother Nature better than Jane Palmer, co-creator of the Noon Solar line of bags and now the founder of the first�and so far only�natural-dye production house in the United States. Launched in January and based out of Chicago, Noon Design Studio is committed to using sustainably harvested natural materials as a low-impact alternative to toxic fabric treatments. More significant, however, is that it endeavors to do so at a cost-efficient, production scale.